The other night I told my daughter we were going to church in the morning because it was a holy day of obligation. When she argued that it was a weekday and not a church day I told her we were going to celebrate the virgin Mary. 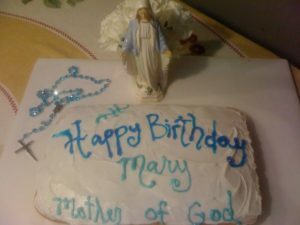 I explained that we have all kinds of celebrations for Jesus but just this one day for his mother who was so important. She asked “will there be cake?” I guess it’s not a proper celebration without cake in her mind. I almost lied just to get her to comply, but I knew that would somehow lead to me actually purchasing a cake, so I stuck with the truth. When I shared this story with my husband his reaction was “I’ll go to church with you if there’s cake!” Now he is sending me photos of cake ideas. He’s going to be really surprised when he comes home to find 24 cupcakes with rosaries on them. He forgets it is summer and I am home with a small child all day – we have nothing but time. So for anyone who didn’t celebrate the Assumption with a little cake after mass – you are doing it wrong.